Get Fit with the UFIT Series! Are you ready to totally transform your body? If so, then this is the workout for you! 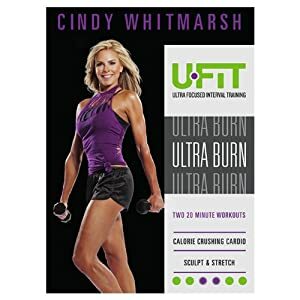 UFIT training from Cindy Whitmarsh is a revolutionary new approach to burn fat, blast calories and build lean muscle, fast! What is UFIT Training? It’s an intense interval training method that uses targeted intervals to turn your body into a calorie-burning machine while building a sleek, toned physique! Interval training is one of my favorite workouts and I love that these are really effective workouts in only 20 minutes! The Ultra Tight program consists of two, 20-minute programs. Hard Body is a full body workout of three-minute circuits. There's one minute of intense cardio, followed by two minutes of "trouble-spot-toning" strength training. You'll zap fat and tighten EVERYTHING! With 6-Pack Abs, you get a cardio ab workout composed of one minute of cardio followed by one minute of middle-chiseling abwork that creates the flat tummy you want. The Ultra Burn program gives you two, 20-minute workouts! Calorie Crusher is comprised of two-minute intervals. You start with one minute of high intensity cardio followed by one minute of lower intensity cardio. This innovative sequencing helps you burn maximum calories and get RESULTS! During the Stretch & Sculpt workout, you lengthen, stretch and totally tone your entire body. This workout is a great complement to the Calorie Crusher workout! Buy It: You can purchase these DVDs for $12.95 each from Amazon.com.